As we get deeper into the November holiday month there are two things on everyone’s mind: Food and Family. You may be asking yourself what you are going to serve to attending guests for Thanksgiving or what you are going to bring if you are heading off to someone else. You may be already planning for your Christmas meal or your New Years night Celebration and all of that is exciting and fun and a welcome part of the winter. But there are people out there, all over the world and right here in America, that are also thinking of Food and Family– but in a different way. 16 million kids in this country consistently do not know where their next meal is going to come from. That is 1 in 5 kids you meet may not have had a meal yesterday, wont have one today and is uncertain what tomorrow brings. 16 million children struggle with hunger each year—that’s the population of Los Angeles, New York City, Philadelphia and Chicago combined. 3.8 million households were unable to provide adequate, nutritious food for their children. 37 states reported that more than 20% of children live in food insecure households. 22 million children in the U.S. rely on food stamps as their primary resource to acquire food. 93% of food insecure families in the U.S. live in stable, non-temporary housing. First, watch this video. The Face of Hunger is not who you may think it is and understanding is half the battle. Admittedly this made me cry. Hunger is a nationwide epidemic. It wont just go away when you are no longer on this earth, so teaching your kids to recognize and assist with hunger is key. 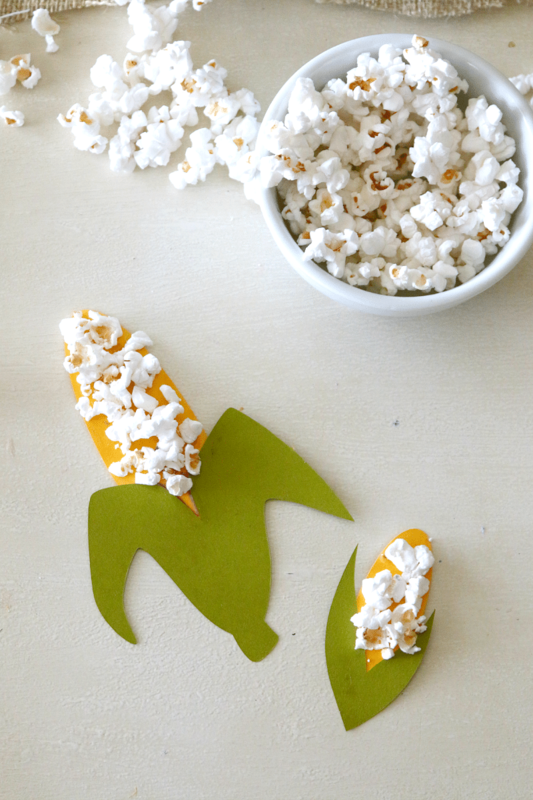 In our house we bond a ton over crafts, so I wanted to also share a food craft with you. 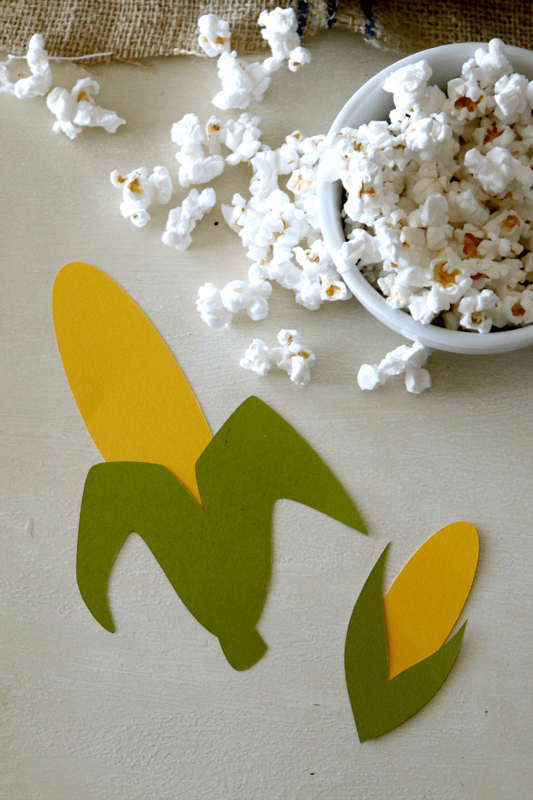 Sit down and create a little food craft- I made an easy corn on the cob craft- and while your kids are there focusing on food, open up to them about how not everyone has food. Ask for their suggestions and get them involved! Perhaps they know someone in their world that needs help. 1) Help your Neighbors: Host a neighborhood potluck where everyone gets together to bring one dish but is served all! You can also make more food than normal so you can easily gift out left over food. Someone close to you may need help but afraid or embarrassed to reach out. But hunger is a community issue and feeding everyone together lends for more than full stomachs- but full hearts as well. 3) Volunteer: One of the most rewarding things that I have done is help pack food for local food banks over the holidays. Bring your kids- its good for kids to learn the value of food and the value of community. 4) Host a Virtual Food Drive: You can raise donations and awareness by organizing your very own online fundraiser. A virtual food drive is one way to help provide meals to people who need them. Here is one! You can donate as much or as little as you want. For every $1 you donate, TEN MEALS are given. A $25 donation rewards 225 MEALS! And because I cannot ask anyone here to do what I wouldn’t do- I donated 225 meals. 5) Participate in Unilevers You Buy One, We Give One drive. Check your Sunday newspaper on November 16th for the Unilever “You Buy One, We Give One” coupon offer. When you redeem the coupon, Unilever will donate one meal to Feeding America when you purchase a participating Unilever product. The offer runs from November 16–30, 2014. These are just a few of the ways you can help out but there are many, many more. Part of what you can do is get educated about the problem and ways to solve it, as well as passing that education down to your children to grow up and respect food and be compassionate and caring towards others. I personally know how blessed I am and we often talk about food waste (and energy waste) in our home to our kids. While I do not think my 3 and 9 year old totally get it yet, hopefully as the years roll by they will start to understand more. Learn how to get involved by going to Project Sunlight and use this holiday season for what its really for- serving those around you.